It's okay if you get confused. 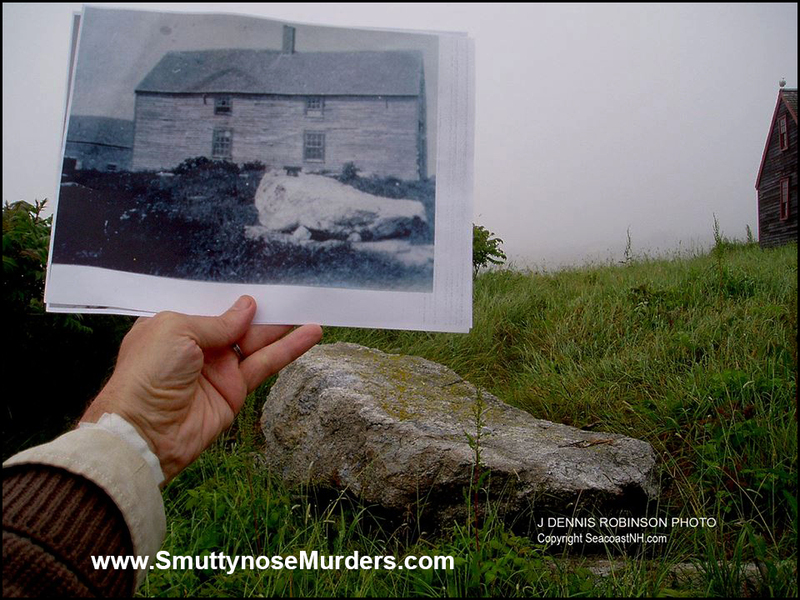 It took me years as a steward on Smuttynose Island to figure out exactly where the Hontvet "murder house" was located. Only two buildings survive on the island today at the Isles of Shoals. Gull Cottage was built in the mid-twentieth century for Rosamond "Rozzie" Thaxter, the granddaughter of island poet Celia Thaxter. The other building is the Haley Cottage, built somewhere between 1770, we think, and 1800 by Sam Haley, whose family dominated the island for decades. A dozen other buildings, including the large Mid-Ocean House Hotel, are long gone. The "Red House." as locals called it, was a simple two-story duplex built just to the right of where the Haley Cottage now stands. The lawn drops down a bit and there is a ring of foundation stones still visible in the brush. The site of the murder house is often obscured in tall grass and there is often a hand-painted sign there to mark the spot. The Hontvet House burned in 1908, although some erroneous reports say earlier. A few years ago someone brought an old photograph of the house to the island. It shows the Hontvet House from the back just beyond a large curiously-shaped rock. Archaeologist Nate Hamilton and I located the rock, now behind the clothes line of the Haley Cottage (where we stewards stay each summer). I held the photo up with one hand, and you can see the empty space where the murder house used to be, with the Haley Cottage off to the left. To indicate the spot even more clearly, I asked my friend Bill to stand on the site of the former Hontvet House. 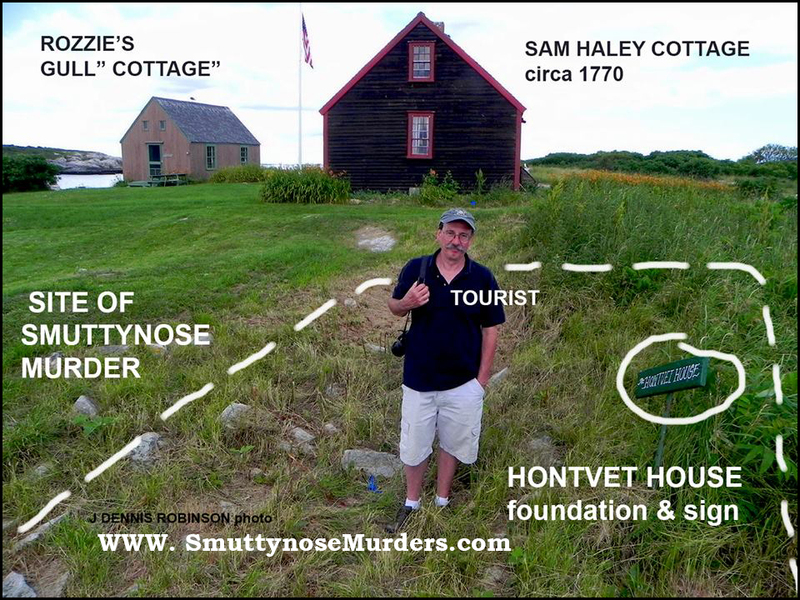 Then I doctored up the photo below to show the location of the foundation in relation to the Haley Cottage and Gull Cottage today. I hope this helps island visitors and scholars of the 1873 murders to get their bearings. All photos and text copyright (c) 2015 by J. Dennis Robinson, SmuttynoseMurders.com. 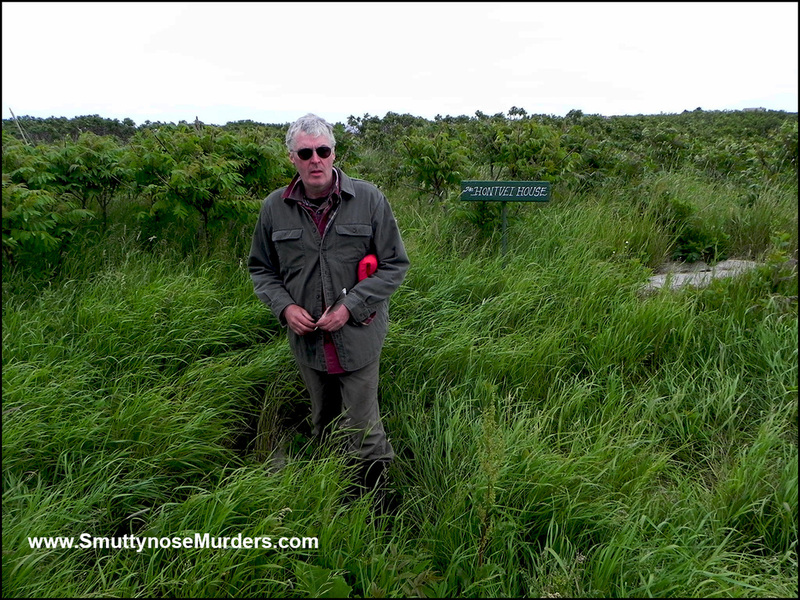 For the full story see Mystery on the Isles of Shoals: Closing the Case on the Smuttynose Ax Murders of 1873.